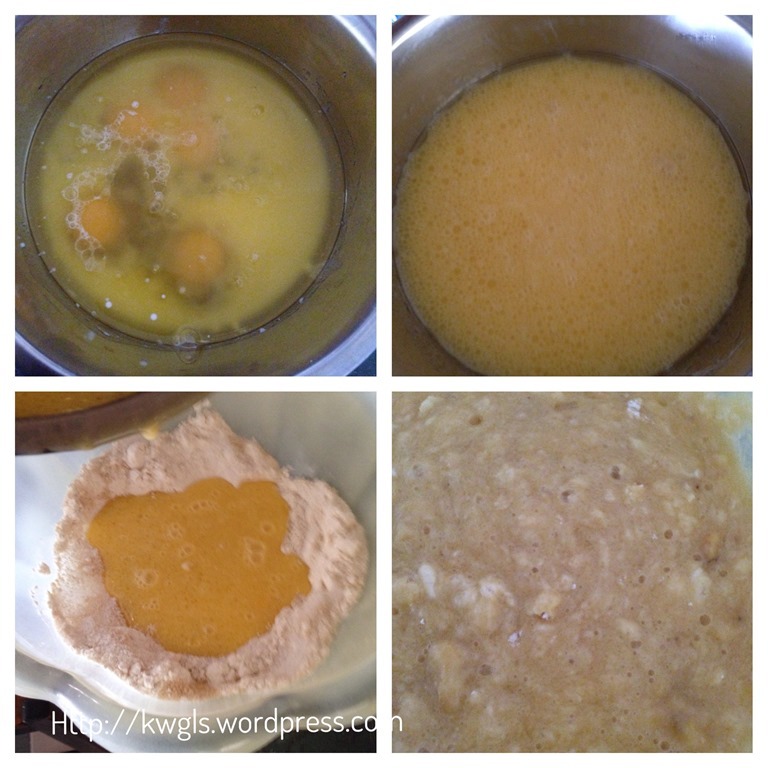 It is fun and easy to make, you can ask your kids to help out as it is just mix and bake. It is tasty, moist and cheesy. I should have put more cream cheese in it. 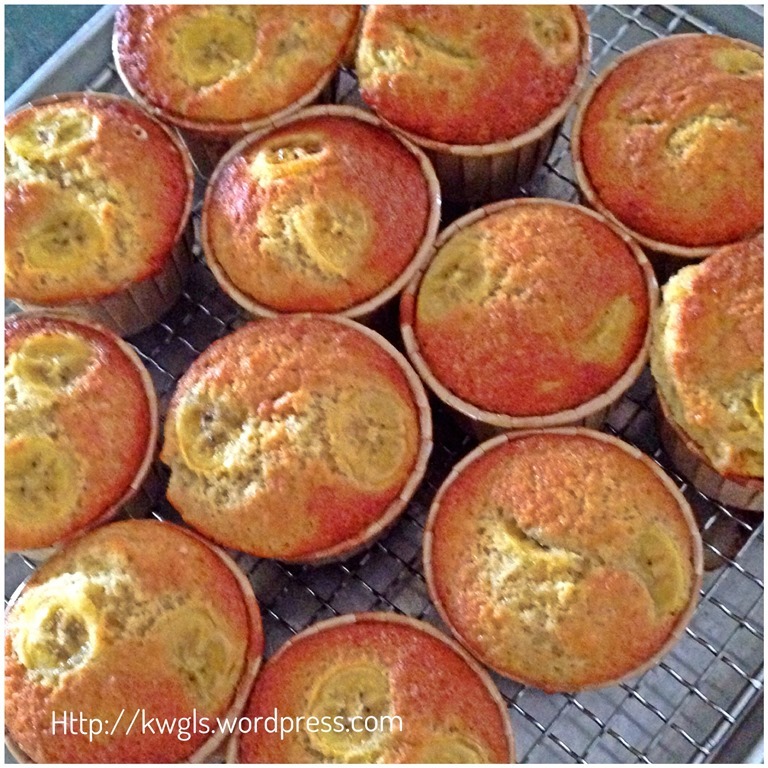 The inspiration of this recipe comes from one of the entries in the FOUR SEASONS BLOG HOP #22 – Pumpkin Cream Cheese Muffins. 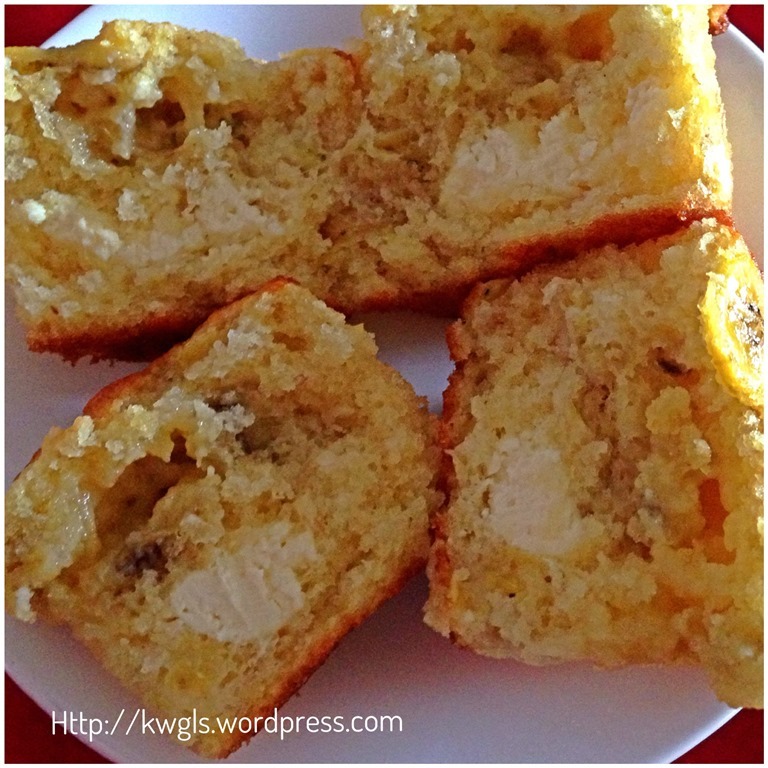 The blog owner, Ms. Christian had her version of pumpkin cream cheese muffins. 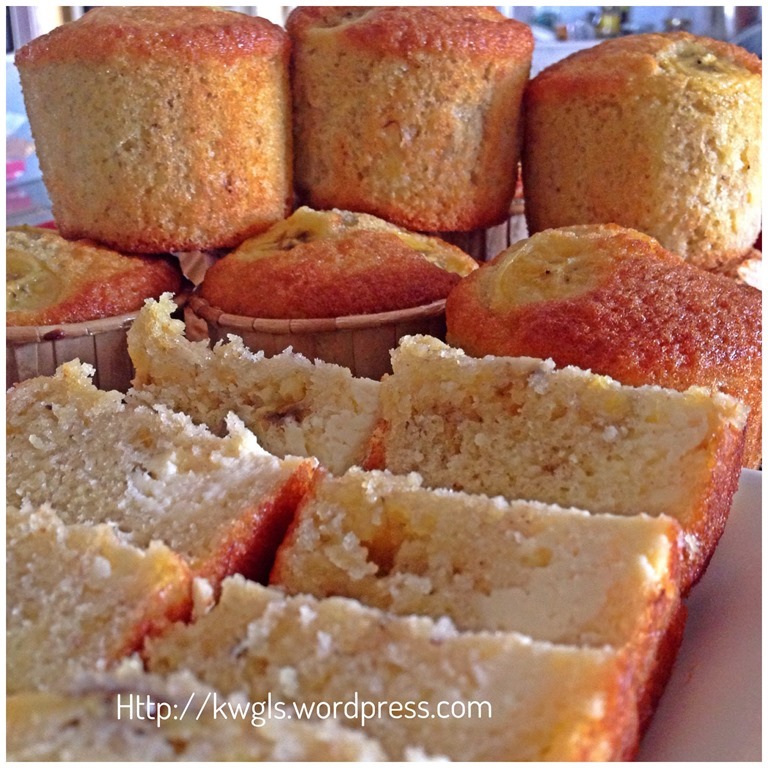 In her muffins, she put one tablespoon of cream cheese in the batter and the muffins looks extremely delish. I commented on her post that since pumpkin prices in Singapore appeared to be unaffected, I will try her recipe by substituting using carrots. She is unsure but she offered alternatives to substitute with sweet potatoes or yams! How kind is she! I wanted to take this opportunities to thank her for her kind advise. This morning when I woke up, I looked at the whole bunch of bananas “sitting” quietly in my dining table. It was ripe and I did not foresee we were able to finish all within a day. Then it stroke my mind the above recipe. 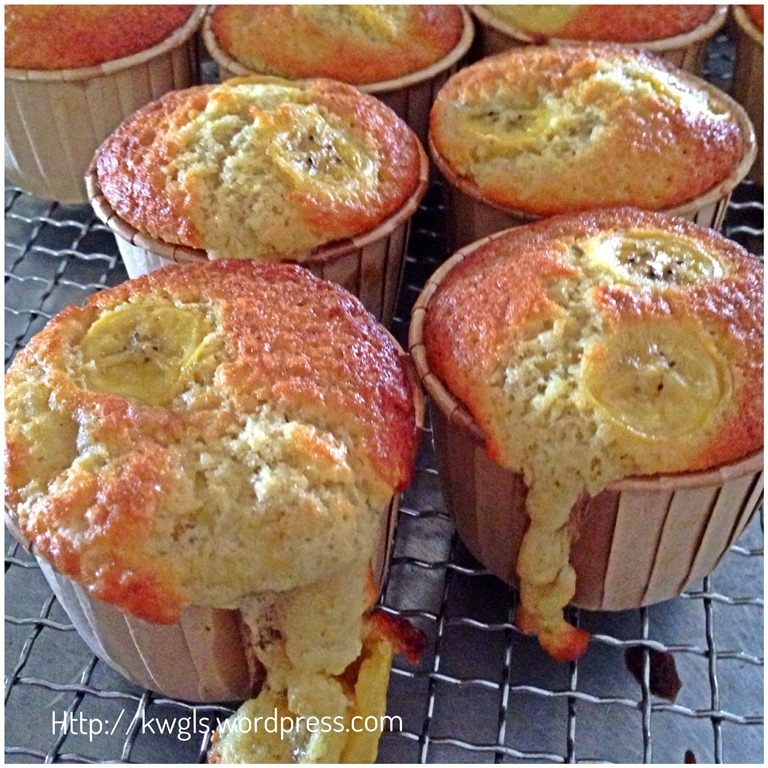 I told myself that I should try to get rid of these overly ripe bananas by making some banana cream cheese muffins/cupcakes utilizing my proposed “one number baking ratio” theory…. and I am glad that the results were very satisfactory as you can see for yourself in the picture. 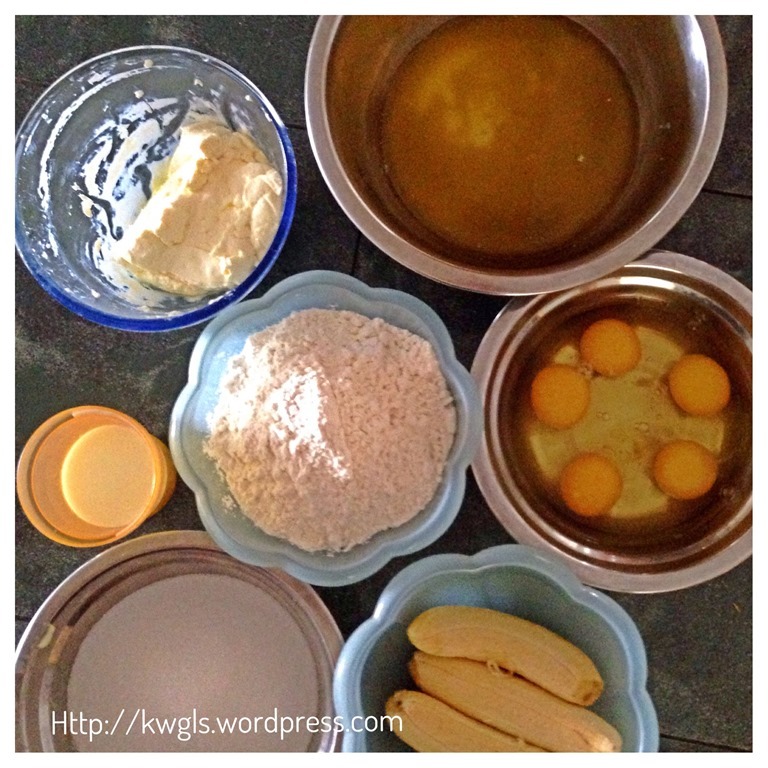 One number baking ratio basically means that using equal portion of the ingredients to prepare the baked products. 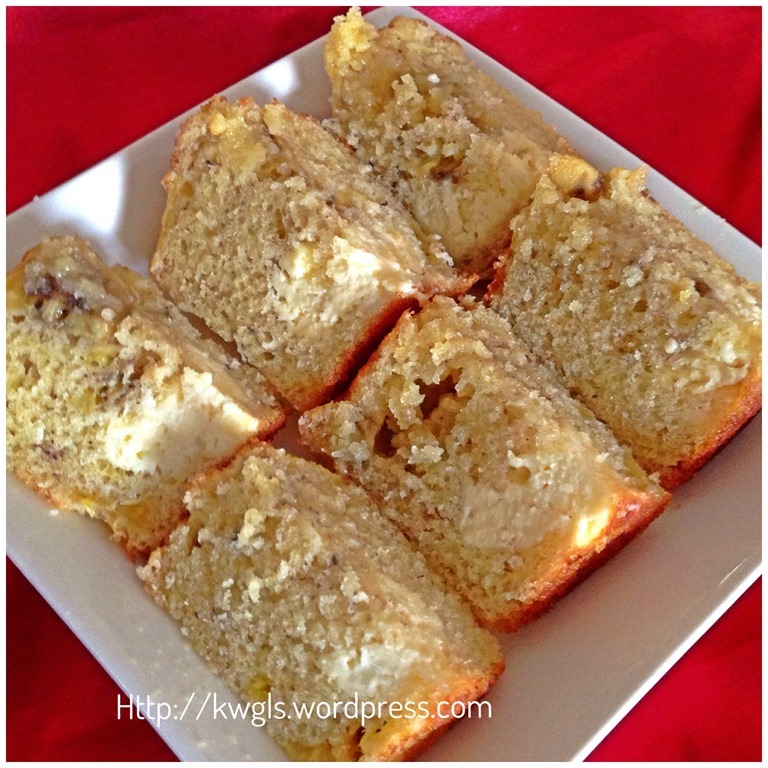 If you are interested to read more about my “one number baking ratio” adventures, you can refer to the following posts –Basic Pound Cake, Peanut Butter Muffins, Fruits Dates Cakes, Zebra Patterned Pound Cake, Grapefruit Cognac Pound Cake，Almond Sugee Cake and Yoghurt Marble Cupcakes. 1 additional banana for decoration toppings. My actual eggs volumes used are =5 eggs x 53 grams per egg = 265 grams and my actual banana volumes used are 175 grams. Therefore milk volume = 100 grams – excess egg volumes (265-250) grams – excess banana volumes (175-150)grams = (100-15-25) grams = 60 grams. Therefore my actual usage today is 265 grams of eggs used, 175 grams banana used and 60 grams of milk. Of course you can just stick to the exact volumes as stated above without performing the above calculations. 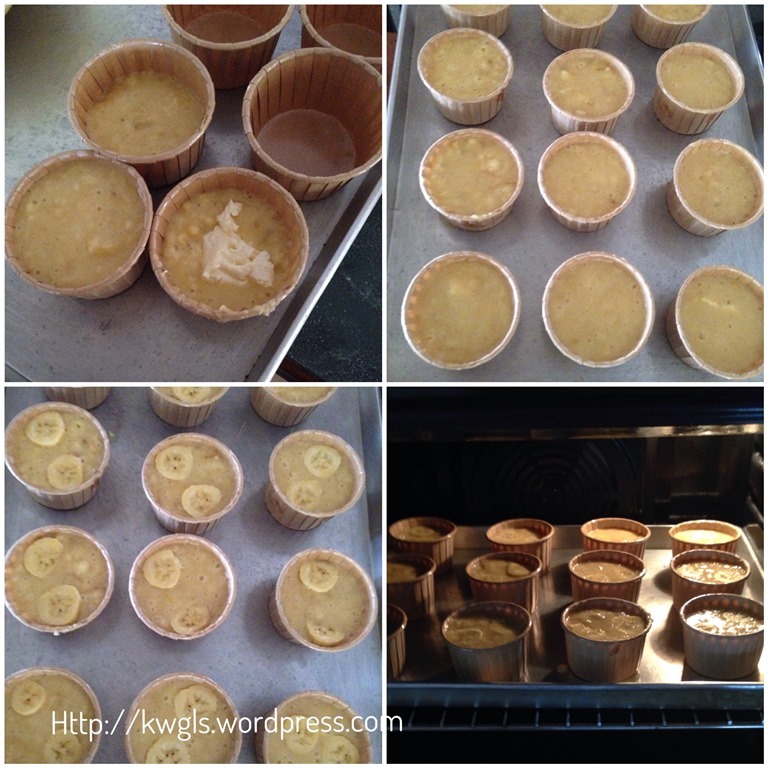 Line 12 medium sized muffin tins with muffin cups or slightly greased the muffin tin with butter. Lightly beat the cream cheese and sugar using the machine whisk or manual whisk until smooth and not lumpy. Set aside for later use. 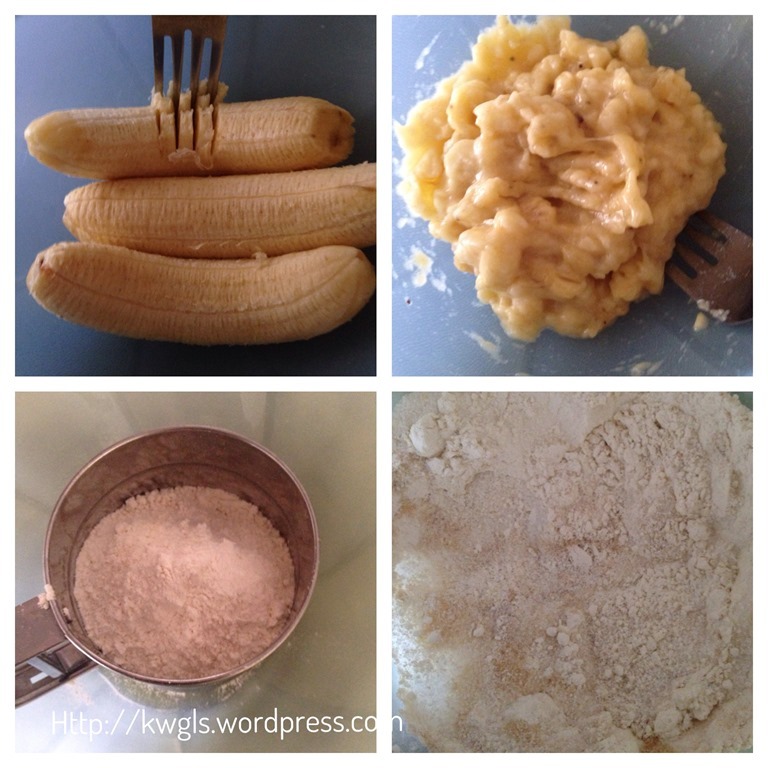 Mesh the bananas using a fork until it is soft and fine. Sift the self raising flour, baking soda, cinnamon powder (spice mix) into the big bowl. Add the sugar and make a well in the centre. In another bowl, mixed all the liquids ingredients (eggs, meshed bananas, milk, melted butter or cooking oil) together, stir until well mixed. Pour the liquid ingredients into the dry ingredients. Use the fork or a big spoon to quickly mix the batter. It is okay if there are some lumps in it. Scope 2 tablespoons of batter into the muffin cups. Add in one tablespoon of beaten cream cheese. Ensure that the cream cheese does not touch the walls of the muffin cups. Fill in additional batter until it is about 80% full. Cut 2 thin slices of bananas and placed on top of the batters. Baked in the oven for 15-20 minutes or when a skewer inserted the skewer comes out clean. 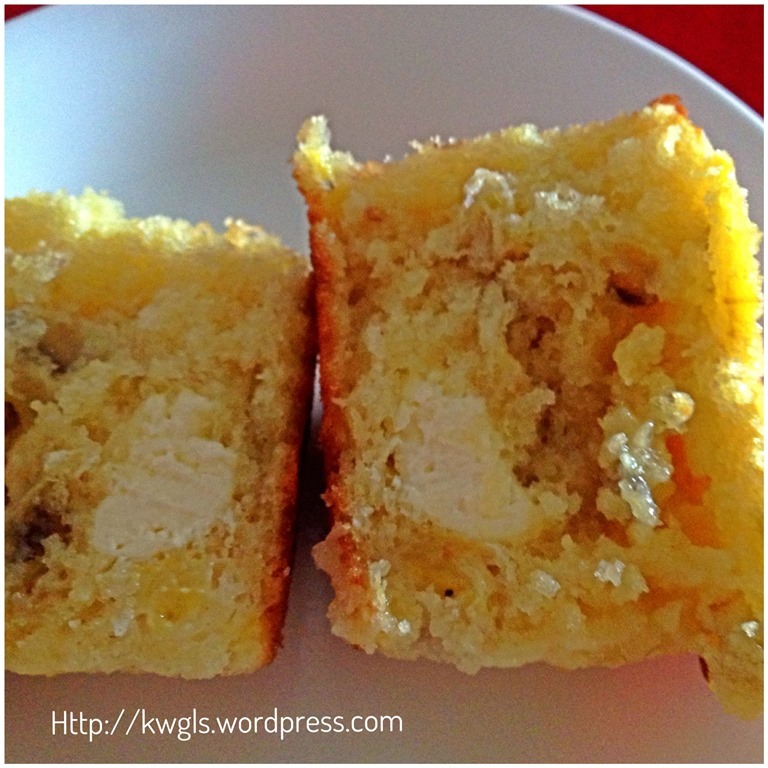 But note that there are melted cream cheese inside the muffins, so it is best that you inserted near the muffin cups. Note: make sure all the batters have cover the cheese and so that there is no chance for the hot cheese to leak out. Otherwise, it will resulted in an elephant muffin like this. This is a bake that I will strongly recommend. Easy, fast and tasty. Be it a muffin or a cup cake is up to you to call it though there is a thin line to differentiate a muffin from a cupcake. This bake however felled in both muffins and cup cakes categories. 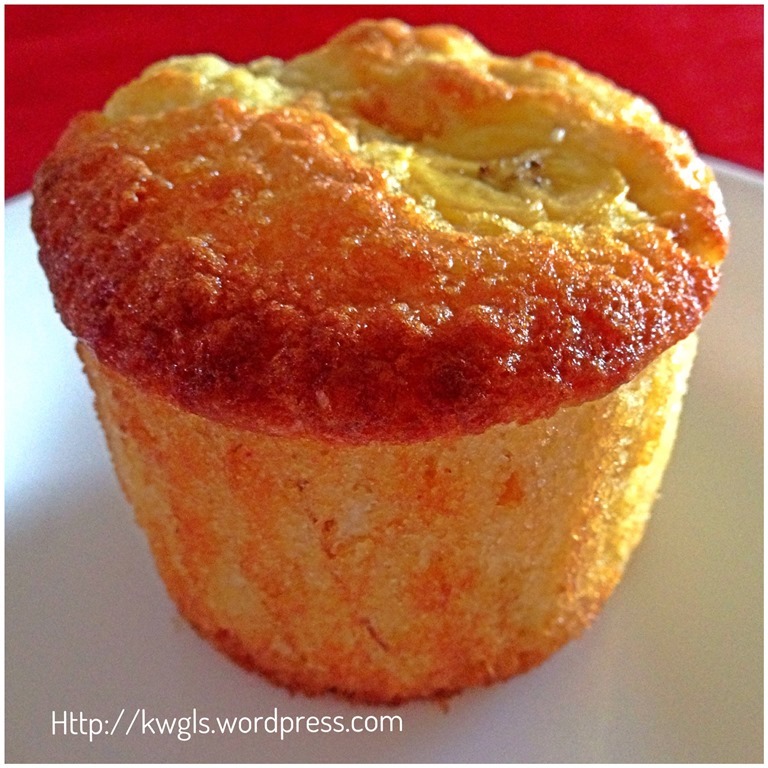 It is a muffin because there is no creaming but a simple mix and bake. 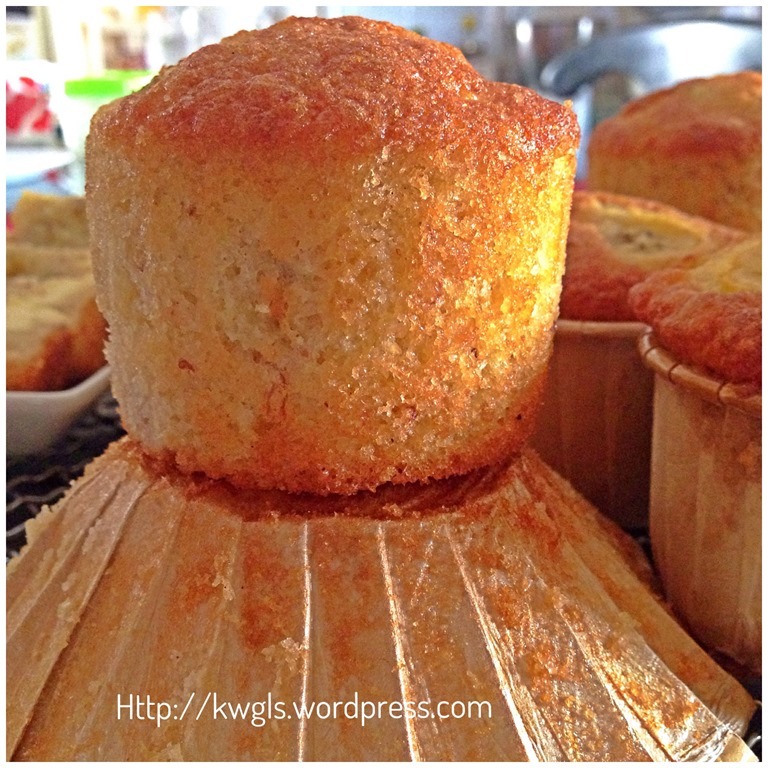 It is not a muffin because it’s fat content have reached the cake level and its flour is relatively less than what is usually used in a muffin….Sound confusing, never mind, me too. Since I have to give it a name, I have decided to call it BANANA CREAM CHEESE CUPCAKES. Hope you like the post today. Cheers and have a nice day. For more recipes, you can refer to my RECIPE INDEX here and you can follow me at PINTEREST or visit this blog’s FACEBOOK PAGE. 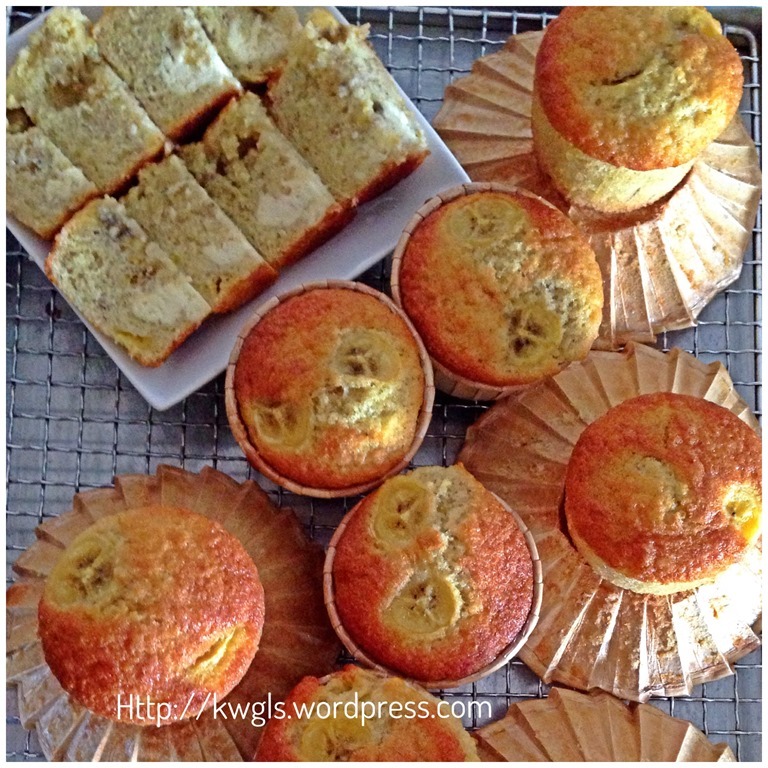 This entry was posted in Cakes and cookies, Food Preparation Series and tagged 8, Banana, banana cream cheese cupcakes, banana cream cheese muffins, cream cheese, Cupcake, Guaishushu, Muffins, one number baking ratio, postaday. Bookmark the permalink. Kenneth, these look sound and look really good Kenneth. I like that you took someone’s recipe on our party and made it your own! What a great combination of flavors! Thanks for sharing at Saturday Night Fever! 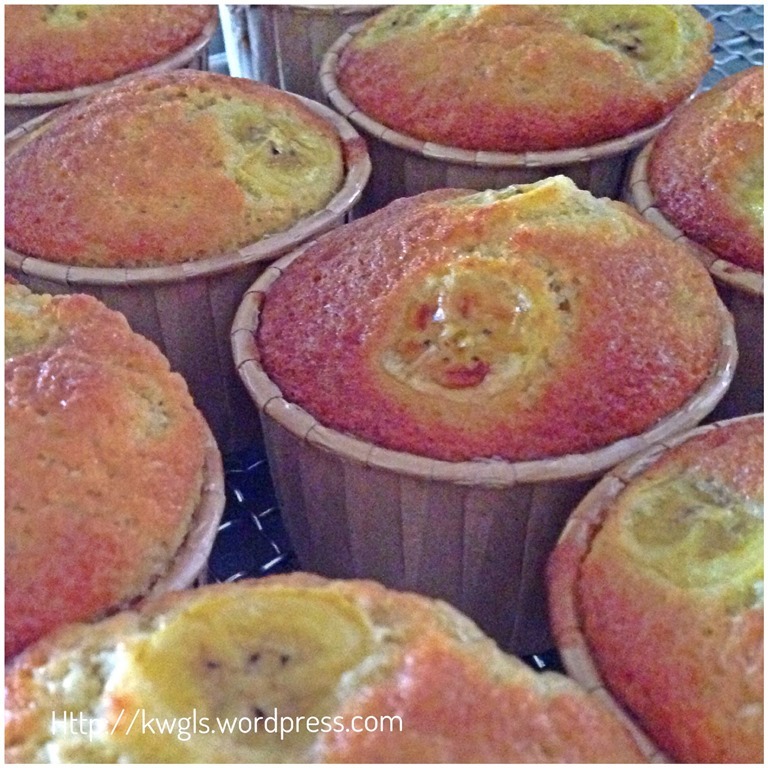 Banana ~ Cream Cheese where could you go wrong and they would make a yummy moist cupcake I am sure. Thanks for sharing on Foodie Friends Friday and I hope that you will join us again tonight for our Halloween Party. hello! why do you add icing sugar to the cream cheese? Can i not add so my 13mth baby can enjoy these as well? Yes. You can. Cream cheese slightly salty, adding icing sugar to make slightly sweet. For baby, don’t put cream cheese. Remember to place the banana at the right position.